Seattle's Best Level 3 Coffee, Portion Packs (1.75 oz., 42 ct.)-2 PACKS by Europe Standard at Jakis Cafe. Hurry! Limited time offer. Offer valid only while supplies last. 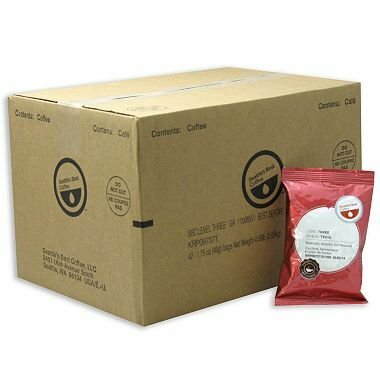 Seattle's Best Blend is an award winning sweet medium roast created from a signature combination of Indonesian, Central, and South American coffees. Seattle's Best Blend is an award winning sweet medium roast created from a signature combination of Indonesian, Central, and South American coffees. The enticing aroma and nutty sweetness is irresistible. And with the Seattle's Best portion pack, you get the perfect cup of fresh coffee every time. Each box contains 42 portion packs which has 1.75 oz. of coffee. If you have any questions about this product by Europe Standard, contact us by completing and submitting the form below. If you are looking for a specif part number, please include it with your message.